Hello Everyone! It's Carol here today. Where do you get your inspiration? Great questions right. Inspiration comes from everyday things. It might be anything, nature, food, clothes, magazines, people, the internet! 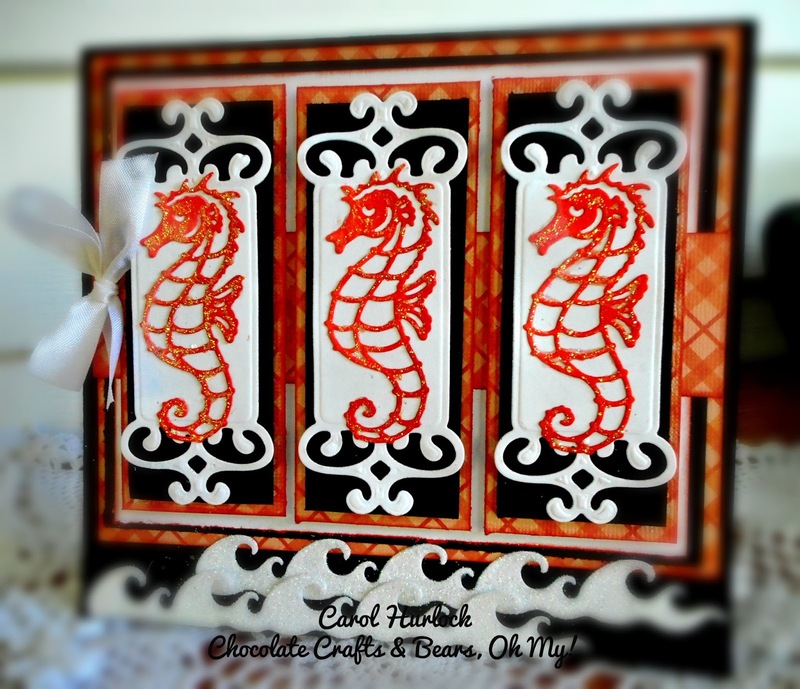 The inspiration for this card came from a Dragonfly that I saw when I was in the pool last weekend. 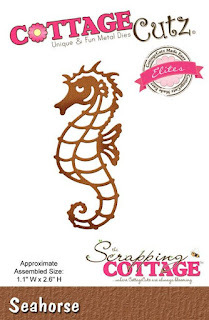 That dragonfly was the color of these Seahorses from CottageCutz. I had never seen a dragonfly that color and I was just so amazed. I knew I just had to try the color. 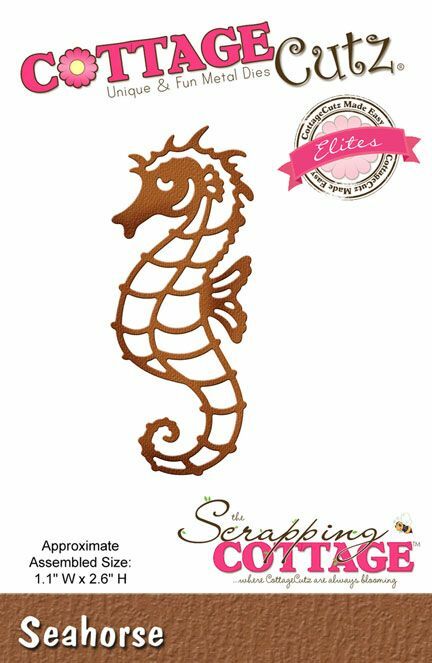 I cut the CottageCutz Seahorse on watercolor paper. To achieve this beautiful color, I distress inked the seahorses with ripe persimmon and barn door distress ink and placed crystal stickles on the top. They are so pretty layered on this label die. 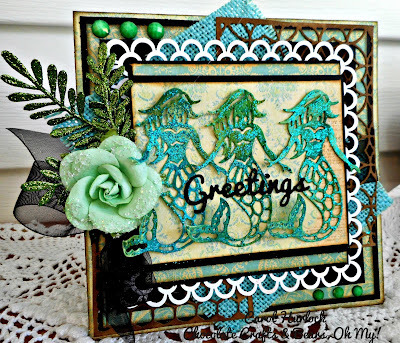 For the wave border, just cut on white cardstock, paint with glitter and you have yourself a sparkly border. 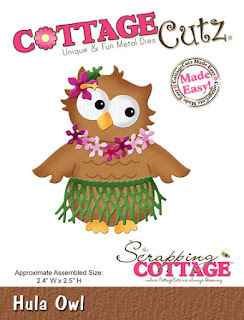 Owls are my best CottageCutz motives and I used them a lot in the past. This is also the reason why I choose new Hula Owl from Tropical release. So, my owl went on vacation and put the sign on the door. 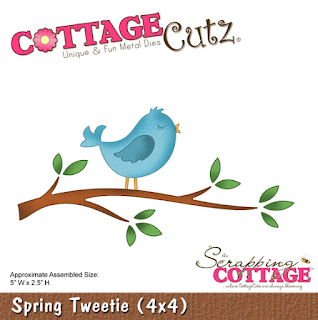 But when you open it, here she is sitting on the branch, which I took from Spring Tweetie die. 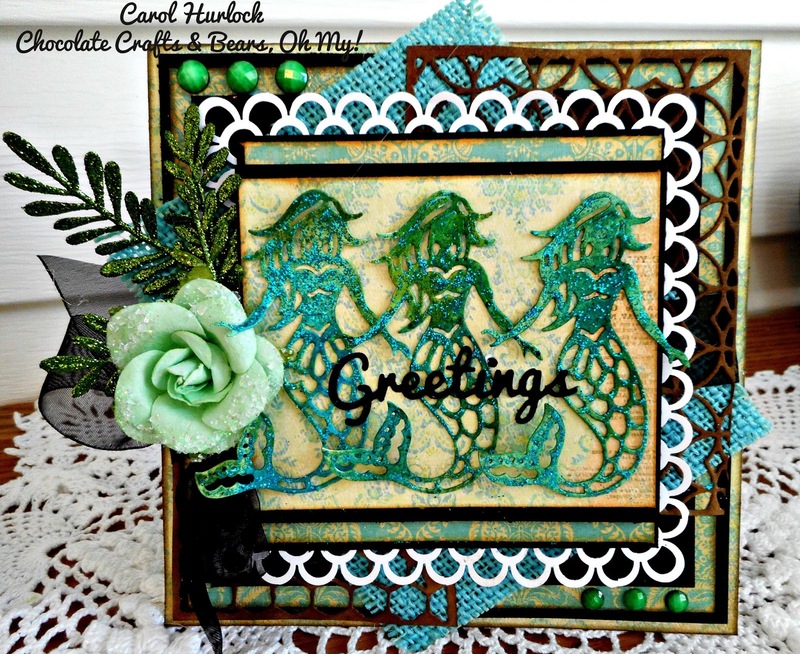 Everything is made from kraft cardstock and colored with distress inks. Hello everyone, today's post is a short one. I wanted to share my card made for 2 of Splitcoaststampers challenge using the sweet CottageCutz Dies. For my project I used Gift Card Holder and Sun & Cloud dies. 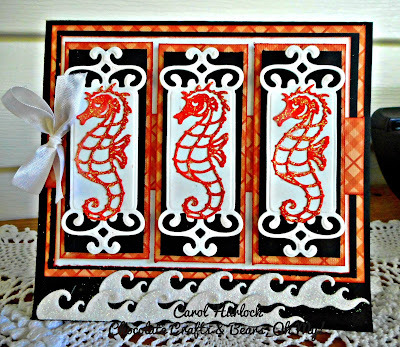 Very easy to make these gift card holder. First, I cut gift card holder out using green-blue card stock. 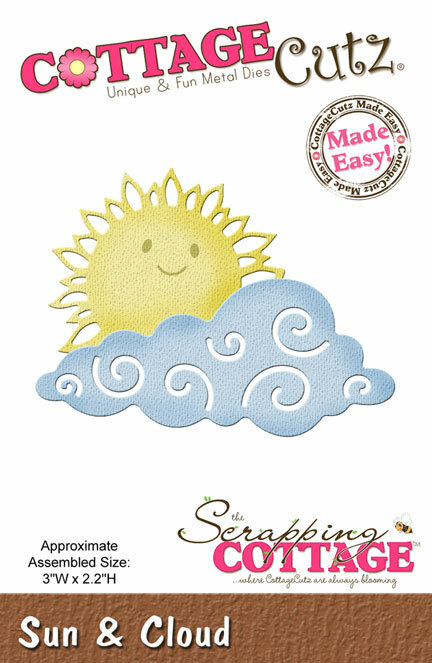 Than, I did made a background for card holder using cloud stamp. Next, I cut images out couple times using white and yellow card stock. After these, I glued on gift card holder sun and cloud using double foam tape. 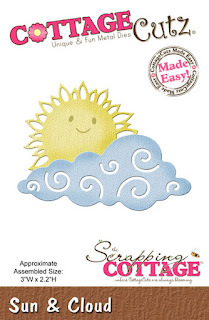 Added sun on back of gift card holder and stamped sentiment. And finally, I added gift card inside gift card holder. Greetings everyone and welcome to another addition of CottageCutz. 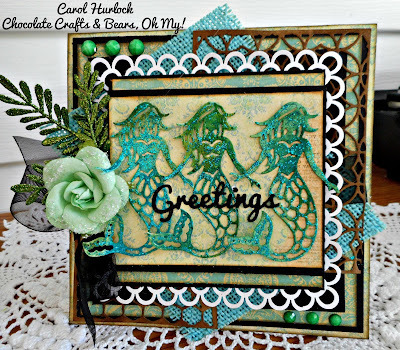 Today it's Carol with a post featuring the beautiful Mermaid die from the Tropical Release. What a beautiful set for the summer. You will love creating with these. 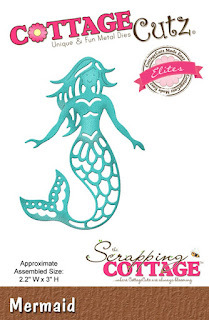 To create the mermaids I die cut them from watercolor paper. 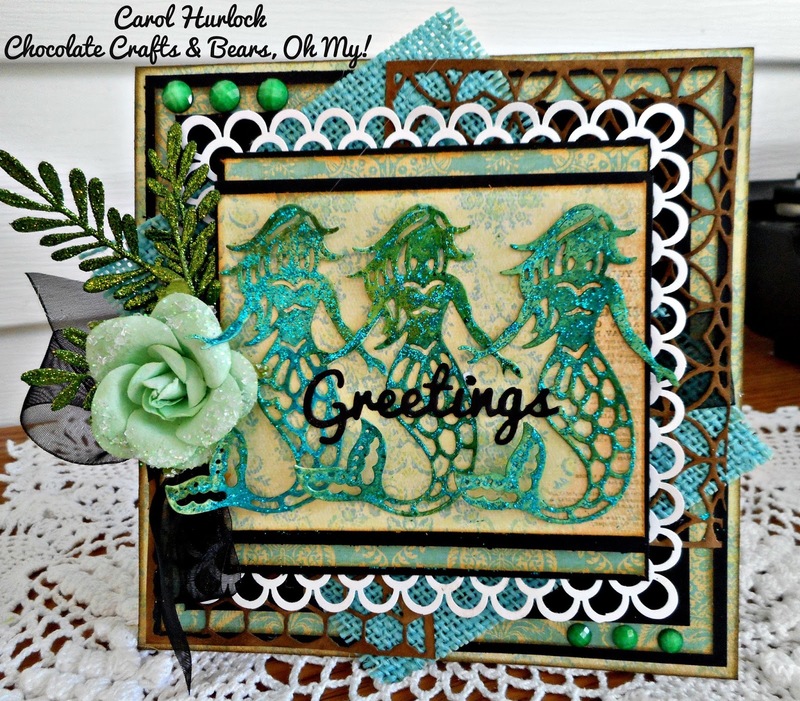 I then used Adirondack ink in Meadow and Steam to color these beautiful ladies. They were then glittered with "Lagoon" Stickles. 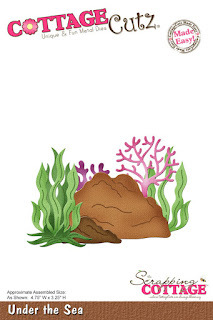 Don't these colors sound so tropical!!! Perfect right!!!! Today I have special card for you because I made this window which looks like water. I found instruction on internet, but I used thicker shower gel instead of hair gel and put it into small plastic bag. I sealed it with scotch tape and put it between card base and front cardstock which looks like wood. Inside of the card I put with distress inks colored circle and following die cuts: Happy Fish 1 and Under the Sea. It really looks like fishbowl and it was really fun project. But After I finished it and I was pushing gel around to get smaller bubbles, bag burst a little bit and my gel started to coming out. I've tried to save the card with scotch tape but it was to late. I had to cut off the front part of the card. So, my advice is to use thicker plastic bag and don't send such card with regular mail. But it can work and it looks fantastic, so I think I will give it another try. I was a little sad for a moment but because project itself was so fun, my sadness got away quickly. Have fun and have great weekend! 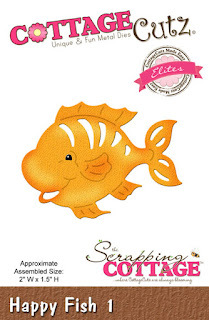 For this project I used super cute images from new Tropical Release: Happy Fish 1, Happy Fish 2 and Happy Dolphin. I think this is good idea put cut image on your straw. I love the way everything turned out on my card for today. I truly love airbrushing, and all this pieces were super fun to airbrush. Dp is from Echo Park and is called "for the Record 2" I also added some Viva Pearl Pen for the eyes. Lastly I added a Button and some ribbon for my bow! 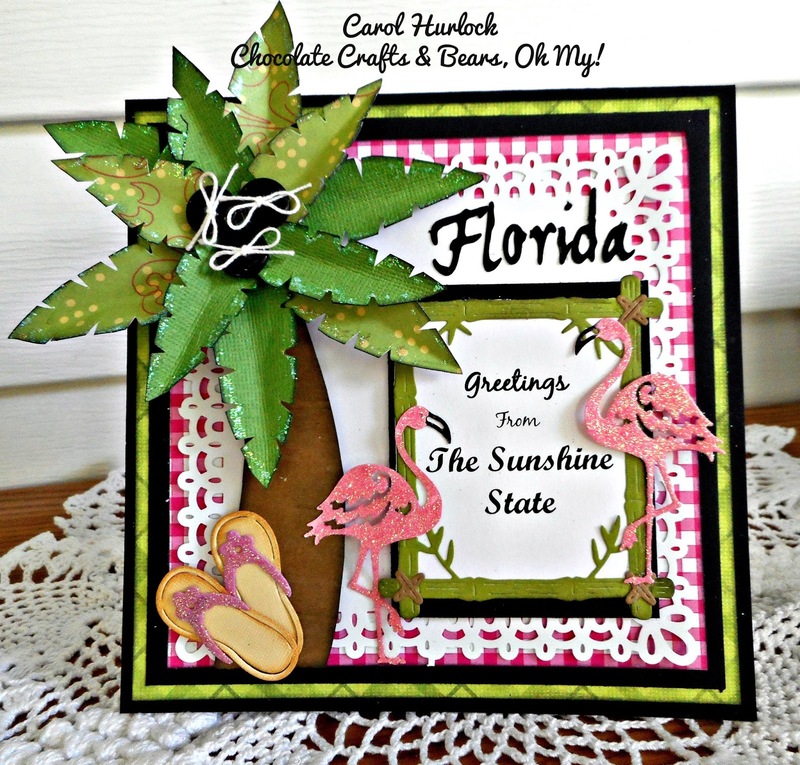 Greetings friends and crafters from Florida The Sunshine State. 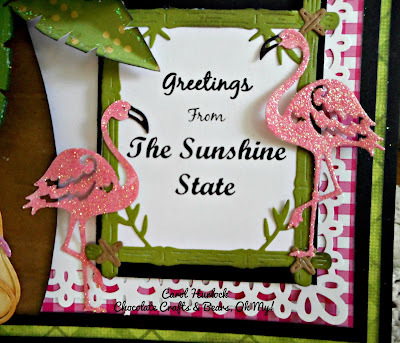 Have you been to Florida and seen the beautiful Flamingos. Nothing says tropical paradise like Flamingos and Palm Trees. 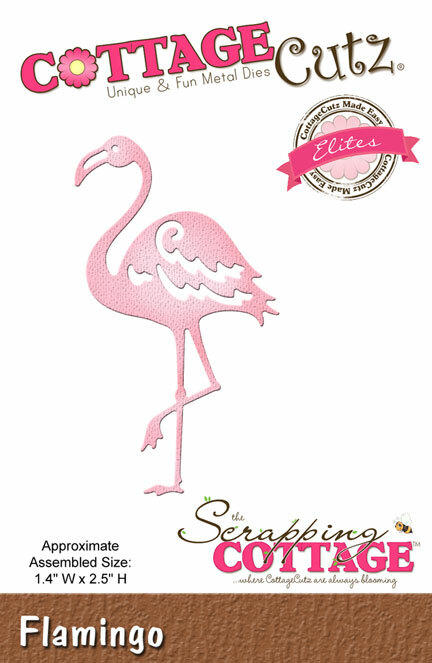 How cute is this Flamingo die from CottageCutz! 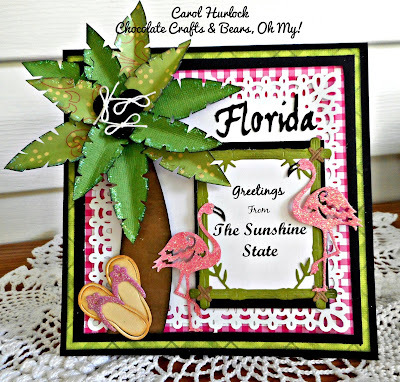 The Tropical Frame die was used for the Greetings sign. 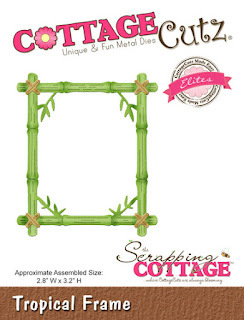 I love the rustic tropical feel of the frame. It reminds me of the decor at the Polynesian Resort at Disney World. 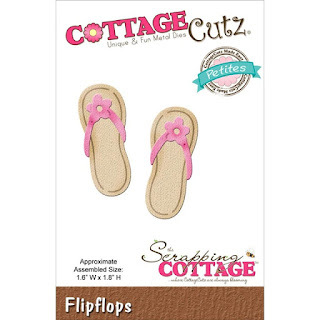 What's a tropical vacation without your flipflops. 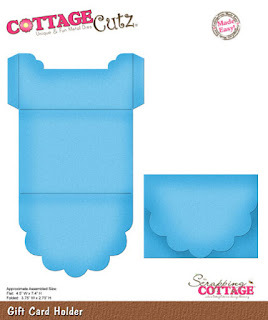 That is such a super cute die from CottageCutz. A Martha Stewart punch around the page was used for the white square. 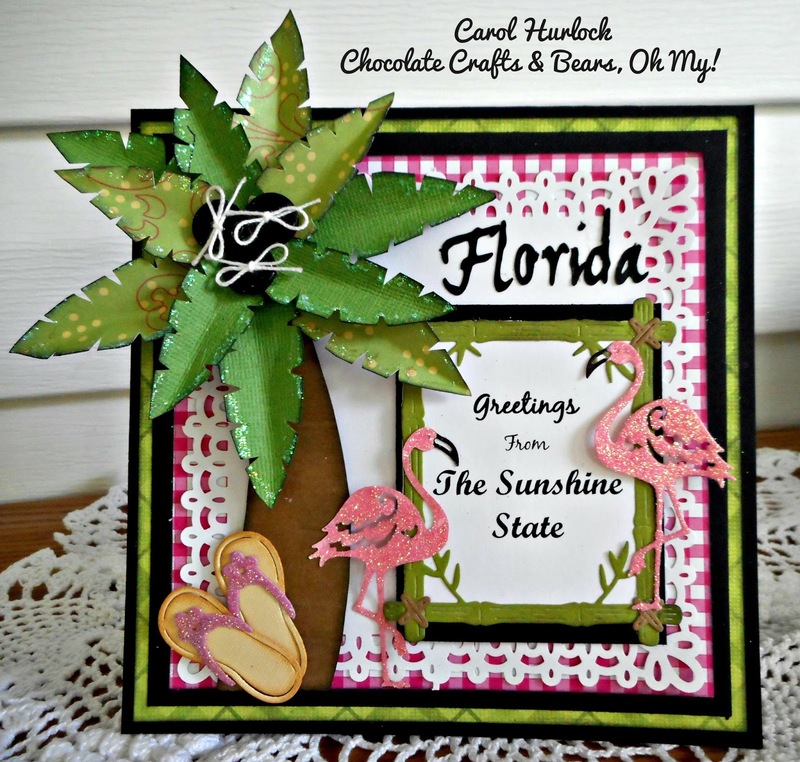 The palm tree was cut free hand out of a printed green cardstock and a plain green cardstock with the trunk of the tree with brown cardstock. The sign was printed and cut out from my computer. 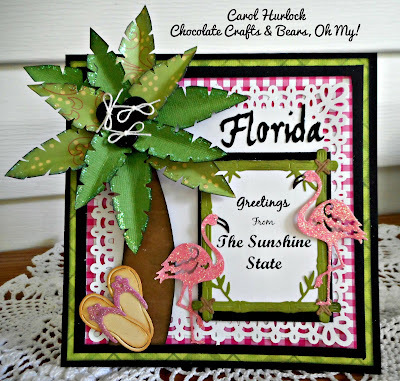 The word Florida was cut with a Cricut. 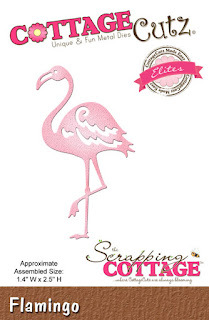 The beaks on the Flamigos were colored with a Black Copic Marker and their bodies were painted with glue and glittered with Martha Stewart Pink Glitter.